One thing I love about travelling is suddenly seeing that unexpected something which sends shivers down your spine and makes the hairs on the back of your neck stand up: the beautiful gardens of Ninfa in Italy; local fishermen dancing in an old waterfront warehouse in Crete; or a small ruined temple set amidst olive groves full of spring flowers in Turkey. 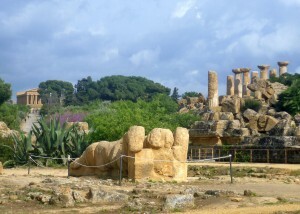 And at Agrigento in Sicily, I saw the telamon. 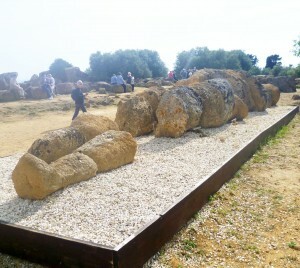 The telamon in Agrigento Museum. ; c0mpare his height with that of the women standing by his feet. In Greek mythology, Telamon was a King of Salamis and one of Jason’s argonauts who sailed with him on his quest for the Golden Fleece. According to Homer’s Iliad, Telamon was the father of the Greek hero, Ajax (‘That lubber, Ajax,’ as Shakespeare calls him in Troilus and Cressida). The name ‘Telamon’ means ‘support’ or ‘bearer’ and this explains the architectural term telamon, a colossal male figure used as a column. Fallen telamon – his feet are facing us. Note the size compared with the person behind his knees. Telamones (plural) are the male equivalent of caryatids, those draped female figures who masquerade as columns and hold up roofs, the most famous being the caryatids which support the Parthenon. They can also support mantelpieces as this example from Dillington House in Somerset shows. 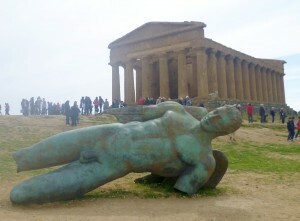 In the 5-6th century B.C., Sicily was part of Magna Graecia (Greater Greece). 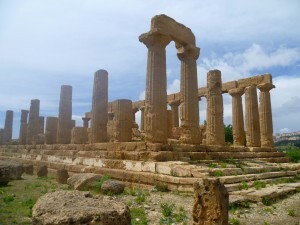 They built a line of impressive temples just outside the city of Akragas (modern Agrimento). The largest of all is the temple to Olympian Zeus, and its upper floor was supported by thirty-eight enormous telamones , each over 25 feet tall. The telemones were made in sections and, after two and a half thousand years of weathering, they were not at first recognized for what they were as they lay scattered on the ground after the temples were destroyed by a massive earthquake in 1401. However, once recognized, one was removed to the museum at Agrigento and erected in a specially built room (see top of post). It was this which made the hairs on the back of my neck stand up. Note how small his feet are compared with his huge head and arms – an optical trick called entasis which makes the figure appear in proportion when viewed from the ground. Temple of Olympian Zeus and a fallen telamon. We are looking at the top of his head: his elbows are bent up to help his head support the upper floor. It is only recently that the telamon pictured above has been recognized and reassembled on the ground beside the fallen temple. Nobody really knows how they fitted onto the building; the Agrigento museum has a model of the temple showing the telamones in place, but it’s only an educated guess. And if they really do support an upper floor, the temple itself must have been absolutely vast. And that’s the attraction. The sheer scale of the telamones provides the Wow! factor, but there is also the mystery of how they would have looked in situ – and the hope that one day we might find out. For me, that’s an irresistible combination. Definitely a wow! You do find fascinating subjects to blog about. Thank you, Jan. I’m sure you have your own Wows, too! I’d never even heard of a telamon until I saw this one. And now I see them everywhere. Truncated telamones appear propping up lintels of doors in important Victorian public buildings, for example. Good heavens, what an impressive figure! Must have been the same Wow feeling I got when turning the corner and confronting Michaelangelo’s David for real. What a fascinating post and so full of interesting data. Gosh, I’m learning today! I never knew that’s what caryatids were, though I’ve heard it often enough, but never looked it up. Thank you for such an interesting piece. Thank you for your kind comments, Liz, much appreciated as always. And yes, Michaelangelo’s David – definitely the Wow feeling there! What I love about learning new things is that they often connect to other things. The next time you go down Euston Road between Euston and King’s Cross stations, look out for St Pancras church which has a six-columned portico held up by six caryatids, facing the road. Whenever I go past them on the bus, I silently salute them! I’ll look out for those definitely!